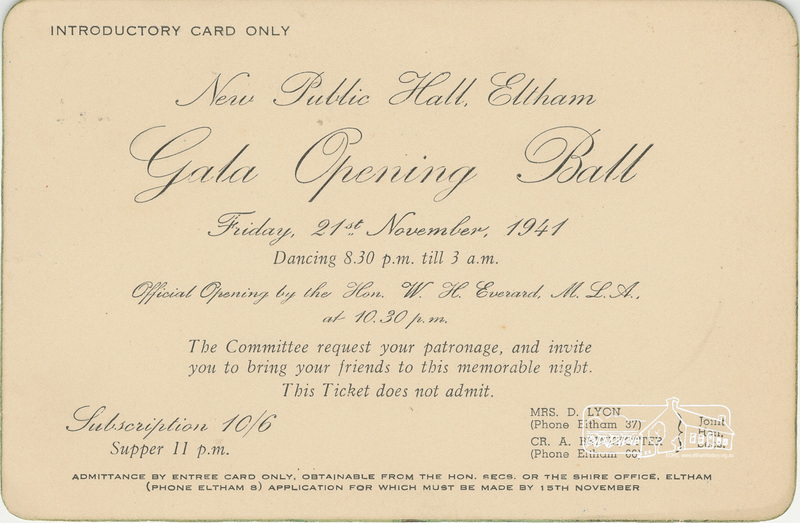 Eltham Shire Hall | Eltham District Historical Society Inc.
At the Movies by Maureen Jones was first published in our November 2014 newsletter. Our Society has very little on movie theatres in Eltham and we are looking for members and friends to help us out with this. This was the time when Kooringarama Films, then the only amateur moving picture company in Australia, and which took its name from the residence of Mr. and Mrs. Boake (York Street), were busily engaged in making their second film. Their first film was “Borrowed Plumes.” Mr. E. Lyall, a local resident was the cameraman and many of the principals and actors were known locally. The Cinema and Theatre Historical Society of Australia (CATHS) was able to tell us that there were movies in the Plaza from 1943-1965 and they ceased sometime between 1966 and 1968. The Plaza was probably another name for the Shire Hall facilities. Charles Plowman was the theatre licensee 1943 -1957, L. Riley 1961-1964 and E.H. Gibson in 1965. From our own resources we have this photograph of the Hall. From our own members we know that Charlie Plowman lived in Lavender Park Road and for all car buffs he drove a 1937-38 era Crossley motor vehicle. Albie Parsons volunteered as a doorman, Jim Crick was the projectionist with Tom Williams as his assistant. CATHS have evidence that films were shown in Montmorency at the Public Hall and it was registered for 120 seats. ‘Exhibitors’ were F. Daley (1949-50), H. Murphy (1950-1951), D.W. Griggs (1951- 1954) and W.J. Mogridge 1954-1955 to 1959-1960). The theatre name was shown in Film Weekly as ‘Public Hall’ until 1955-56 then it was called ‘Mechanics’ for three years then reverted to ‘Public Hall’ until 1959-1960. At one time it was called the Morency theatre. It was listed as a country theatre in late 1950s. 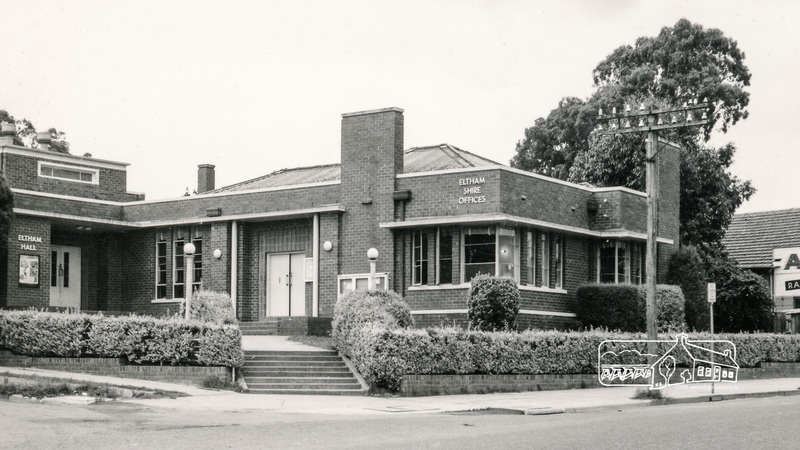 In 1975 the idea of having a dedicated movie theatre was generated by Eltham Rotary with an eye to using a disused building in Montmorency. 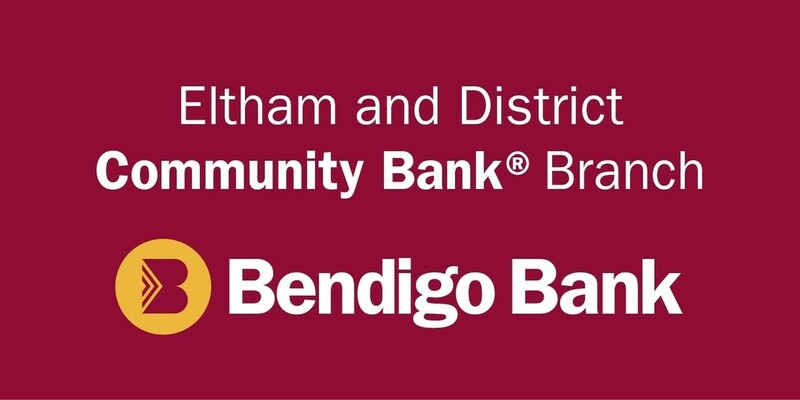 Because of the scale of the project Rotary invited Eltham Apex to become a partner. A management committee was formed and a co-operative finance scheme approved. By combining the two names the Rotex Cinema was named. An architect from Clarke Hopkins and Clarke Pty. Ltd. was engaged and shareholders were drawn from the community. The award winning project involved leasing the disused supermarket in Were Street and renovating it in such a way as to enhance the streetscape and provide a theatre especially for the young and families in the area. This was to be achieved in a straightforward and ecological way designed to make maximum use of voluntary and unskilled labour. From the initial idea to opening took about 18 months. The auditorium seated 200. The decor of curtains, drapes, carpets and seats was in various shades of purple. The theatre opened in August 1976. Mr. Les Clarke won an award for the conversion. Later the theatre was taken over by local commercial interests and renamed the Were Street Theatre. In 1988 the property sold at auction for $625,000 and had its final screening on 12th October, 1988. Further to the publication of “At the Movies” in our November 2014 Newsletter, the Society was able to acquire some stills from the movie “Borrowed Plumes” from the National Library of Australia. An update was subsequently published in our March 2015 Newsletter. Additional research has unearthed details of the interesting family surrounding Kooringarama Films. The movie was filmed by amateur enthusiast Eric Lyall. Eric Cecil Lyall was born in Tooradin in the Westernport District in 1904. His mother Cecile Garnet Warburton (nee Carr) Lyall died in childbirth. Eric was raised by his maternal aunt Ethel May Geraldine (nee Carr) Boake and his uncle Alfred Hogarth Boake. The Boakes lived at Kooringarama in York Street, Eltham. The house, later owned by Alistair Knox, still exists. Eric was the grandson of William Lyall, born in Foveran, Aberdeenshire, Scotland, who had followed his father John Lyall a farmer who had migrated to Van Diemen’s Land in 1832. In 1847 his son William moved to the Port Phillip District and began trading in fat bullocks for the Tasmanian market. In 1851 in partnership with John Mickle and John Bakewell he acquired Tooradin Station in Westernport adjacent to the Kooweerup swamp. The partnership also acquired Yallock, Monomeith, Tobin Yallock Swamp and Red Bluff. He built his substantial homestead Harewood at Tooradin which is now open for tourists. Apart from his farming interest William was a local Councillor, and became a Member of the Lower House of the Victorian Parliament in 1859. Following on from the making of “Borrowed Plumes” Eric Lyall went on to make another film for the Eltham Fire Brigade, and it appears that he may have made one for the local Anglican Church. No trace of these films has been found. In 1929 a four reel, one hour film was produced locally with the title “As Ye Sow”. The principals in the cast were Jack Cornwall, Norman D’Arcy, Marie Bucknell and Gwen Pritchard. The film was directed by Mr. Stanley Walpole of St. Kilda who had had considerable experience in motion picture work in Hollywood, U.S.A. Eric Lyall was one of the photographers. No copies exist of this film either. Eric married one of the “movie stars”, Marie Bucknell in 1930. Eric became a radiographer and was the manager of a company providing tuberculosis screening for servicemen during the Second World War. He died in 1944 at 29 The Ridge, Canterbury, aged 40. His aunt, Ethel Boake, along with Miss Florence Garner operated Kooringarama as a guest house and at one time it was a convalescent home for tuberculosis sufferers. Eric’s uncle Alfred Hogarth Boake died in Eltham in 1940 and it appears that soon after Ethel Boake left the district. She died at Camberwell in 1954 and with her husband Alfred and nephew Eric is buried at Fawkner Cemetery. This photograph from the collection of the National Library of Australia depicts a dramatic scene from the movie “Borrowed Plumes”. With Doug Orford’s expertise we have narrowed the car down to a Jowett “Short 7 1924”; 7 hp 907cc side valve flat twin engine. 11,444 vehicles were produced (including both Short and Long 7s) between 1919 and 1930. It was a 2 door fabric saloon, with a three speed gearbox. Jowett’s was founded in 1901 by brothers Benjamin and William Jowett with Arthur V. Lamb. They started in the cycle business and went on to make V – twin engines. In 1904 they became the Jowett Motor Manufacturing Company based in Bradford, Yorkshire and their first Jowett car was produced in February 1906.